This submission responds to the Innovation Review Terms of Reference to assist the Panel identify gaps and weaknesses in the innovation system and develop proposals to address those gaps and weaknesses with the goal of improved commercial performance. 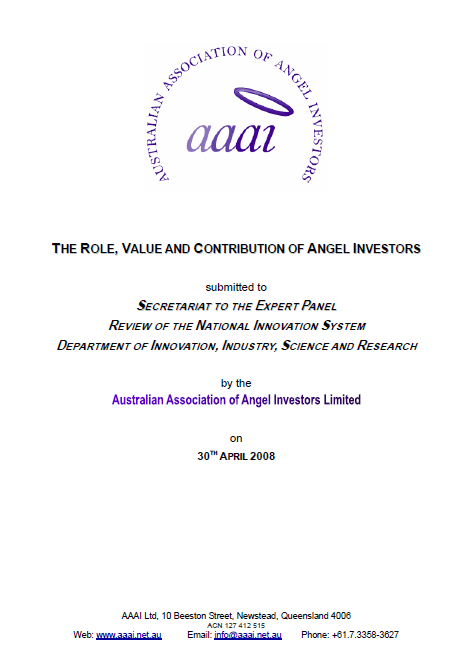 The AAAI has identified the Funding Gap as a critical market failure in the national innovation system that our organisation can address in collaboration with the Government. The Funding Gap is the gap in investors available to businesses between informal, passive investment and the minimum threshold at which venture capital firms and other institutional investors will consider investments in young ventures. The WI has identified the Performance Gap as a critical market failure in the national innovation system that our organisation can address in collaboration with the Government. The Performance Gap is the gap in skills and networks that are required to successfully grow and run highly scalable entrepreneurial ventures that derive their inherent opportunity from innovation. 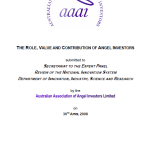 Posted in Angel Investment, Asia Pacific, Federal, Financial Services and tagged AAA, AAAI, Angel Association, Australian Association of Angel Investors, Australian Government, Informal Investment, innovation review, innovation system, Investment, investors, Passive Investment, WI.